Rotherham United are monitoring the fitness of key man Joe Newell ahead of Saturday’s derby showdown with Barnsley. Newell pulled out of last week’s clash at Championship pace-setters Newcastle United minutes before kick-off when his groin tightened in the warm-up. But the Millers are hoping the midfield man, who has been one of their top performers in recent weeks, will overcome the problem which has been troubling him for more than month in time for Saturday’s meeting at New York Stadium. “Clinically, all the tests showed he was fine, but in the warm-up he just said he didn’t feel right when he kicked the ball,” Paul Warne, caretaker manager of the second tier’s bottom side, said. Warne felt his team missed Newell’s “class” as they held the Magpies for more than 45 minutes before going on to lose 4-0. 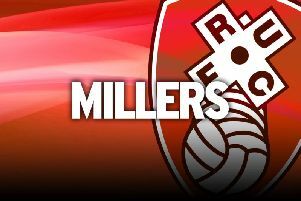 The Millers, looking to strengthen their threadbare squad before the January transfer window closes next Tuesday, head into the battle for South Yorkshire bragging rights nine points adrift of safety at the foot of the table, but the eighth-placed Reds have problems of their own. Young defender James Bree is on the verge of a move to Aston Villa and is set to be followed there by midfielder Conor Hourihane. The corresponding fixture at Oakwell in August brought a 4-0 loss for Rotherham and saw fans shouting abuse at then-manager Alan Stubbs at the final whistle. Stubbs went on to win only two points in his next eight games before being sacked. Left-back Joe Mattock believes the derby offers Rotherham a chance to add to the three wins they have achieved in Warne’s nine league matches in charge. The reserves lost 1-0 at Hartlepool yesterday.